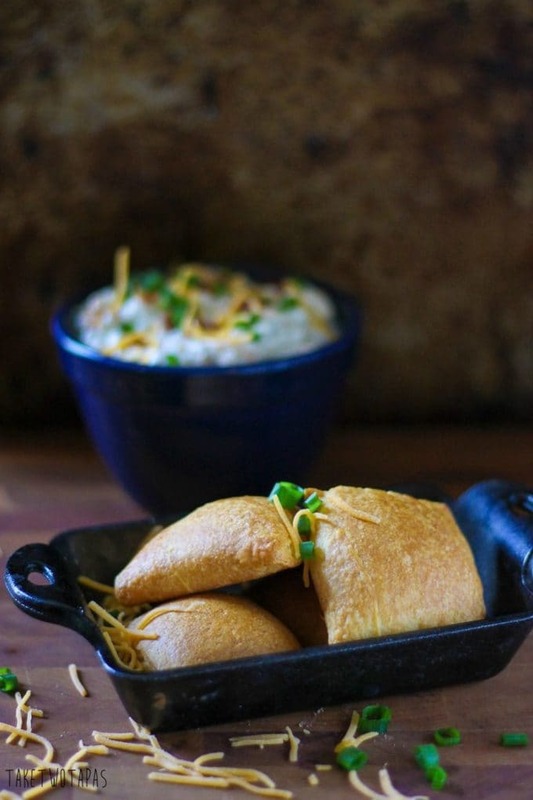 These flaky and buttery Crack Dip Crescent bombs are filled with creamy and addicting crack dip! You can’t eat just one, better make a few batches for your holiday! When I think of all the Holidays, two stand out for me. I like them all, but for me, Easter and Thanksgiving are where it’s at. I like Halloween because you get to dress up, eat lots of candy, and just have fun! Valentine’s Day is over-rated, and Christmas has become so commercialized that I can’t stand it. I mean, seeing garland and ornaments in August is just too much for me to handle. Easter, for me, brings a sense of renewal. Renewal in the spiritual sense, and renewal in nature. Plus a whole lot of Spring cleaning in my clutter-ridden house. It really needs to be Spring for about 37 months to achieve optimal cleaning. Plus a few paid helpers. Thanksgiving is my other favorite. 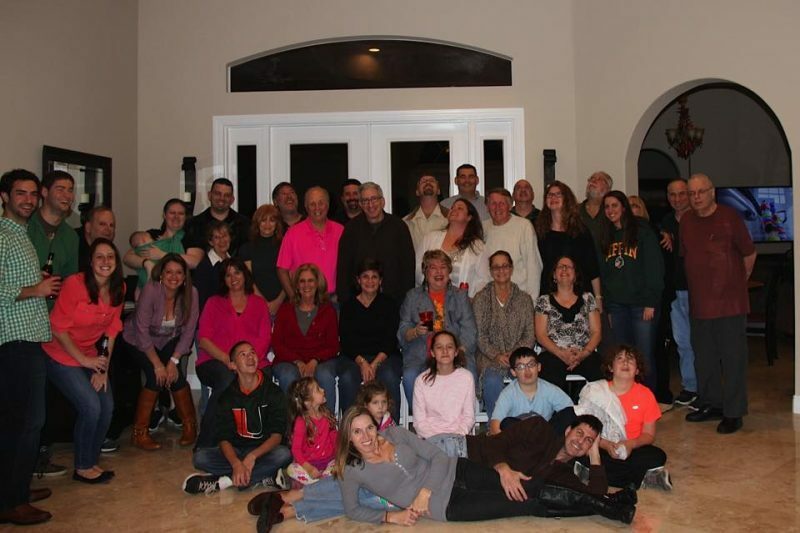 Mostly because we have our annual Traveling Thanksgiving Reunion. 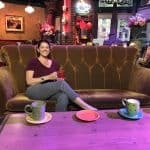 You can read about this crazy weekend in these other posts if you have the time. Our family, which is quite large (about 50 or so attend regularly,) get together for 4 days of non-stop eating, partying, story-swapping, team cheering loudness! We also sing songs. That we have written down. With a backup soundtrack. How many people can say that they have been gathering like that for 37 years? Not many… I am very blessed and THANKFUL to have that. In order to feed all these people, you have to be organized and like to spend hours in the kitchen cooking. Like me, minus the organized part. To keep everyone happy, we serve lots of appetizers or tapas. Looks like I named my blog appropriately huh? I am usually in charge of the appetizers and a few desserts. Plus take home cookies. Everyone likes, and pre-orders, their dozen of my chocolate chip cookies. You can find that killer cookie recipe here. If I was going I would be making this Crack Dip Crescent Bombs recipe that I am about to share with you. 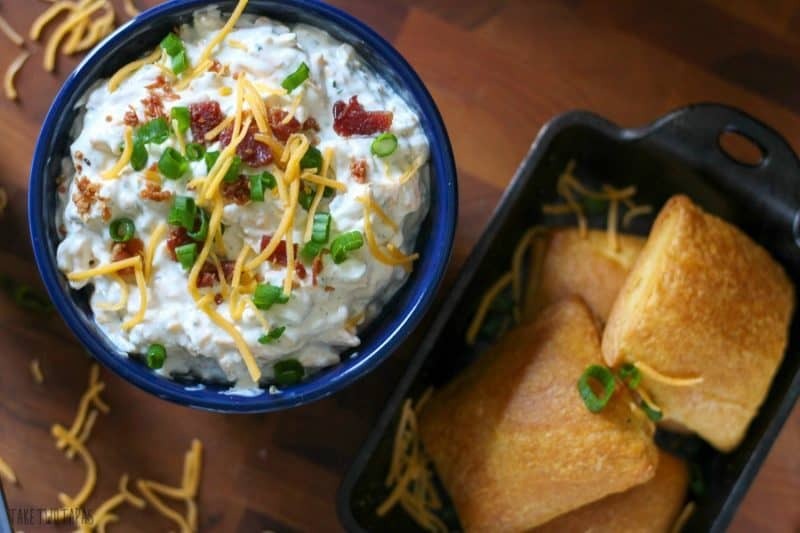 With the help of Pillsbury, I am rolling out some Original Crescent Roll dough and filling it with this addictive dip recipe. Rightly named Crack Dip. 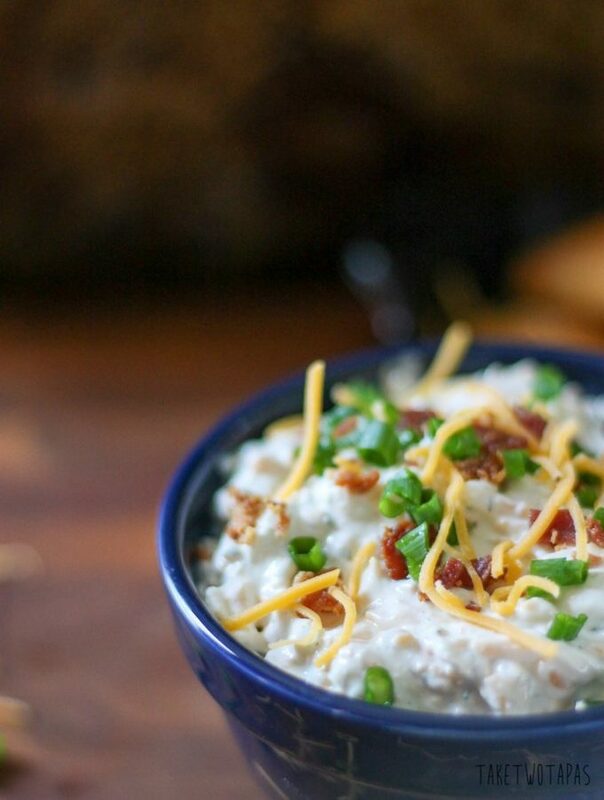 It is creamy, full of cheesy goodness and topped with bacon. Who doesn’t love bacon?!?! These Crack Dip Crescent bombs of goodness are a snap to throw together and will keep all your guests happy while the turkey is cooking! These little bombs of goodness are a snap to throw together and will keep all your guests happy while the turkey is cooking! The Crack Dip is great on its own. I have eaten a spoonful or two, or three, or four. But when you add it to the buttery and flaky rolls they are complete Crack Dip Crescent Bombs. 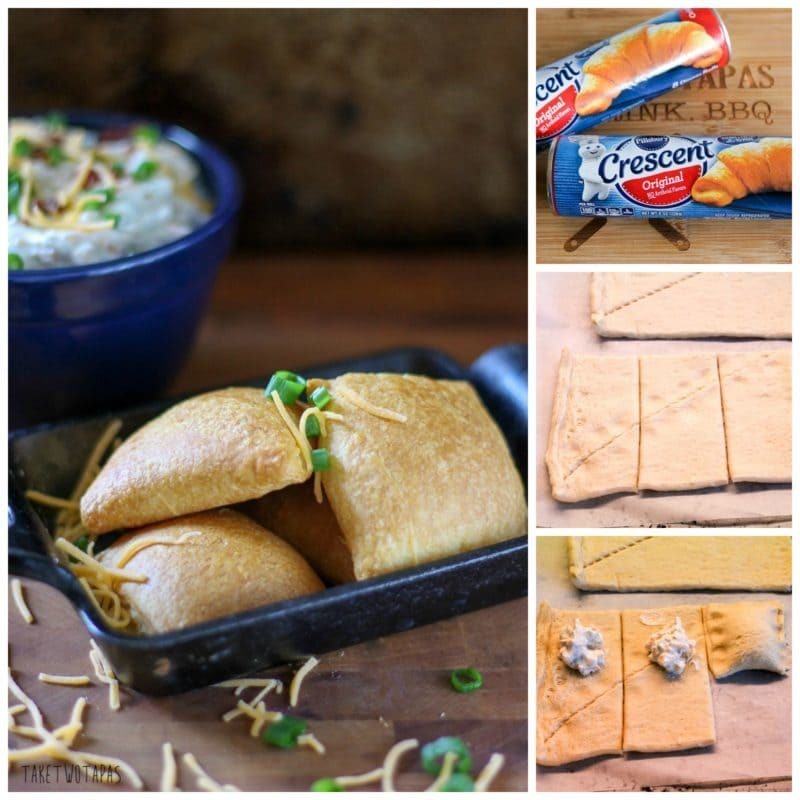 These flaky and buttery Crescent roll bundles are filled with creamy and addicting Crack Dip to make Crack Dip Bombs! The perfect addition to your appetizer menu! 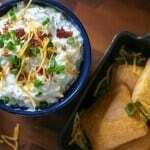 Mix your Crack Dip and store in the fridge for a few hours to let the flavors mingle a bit. This can be made a few days ahead of time if you need to. Keep the triangles together but separate into 4 rectangles. From the short side, cut the rectangles into thirds. You should end up with 12 smaller rectangles. Place a teaspoon of dip on one end and fold over the other end and pinch all the edges closed. Repeat with the other roll of dough. Oh! I love crack dip, so crack dip in a crescent….Yum! OOH! Apple crisp makes me drool! These look delish! Definitely must give the recipe a try for our next gathering. Thanks so much! They were a huge hit at my last party! I hope you like them! Pretty awesome recipes! Gotta try the Bombs! I love baking with my family. We always make pecan pies for Thanksgiving. Those are may favorite and I love adding things to them like bourbon and chocolate! My favorite family tradition is watching the Macy’s Thanksgiving Day parade together! That’ great! I love watching that parade! I am usually in the kitchen so I run out to see all the floats. Gets some exercise! We have a tradition where we go to the nearby field to play touch football after a day of feasting. That’s a great way to burn off some of those calories! My grandmother makes the best sausage and cranberry stuffing every year for thanksgiving. I have never had a sausage and cranberry stuffing! Sounds awesome! Absolutely delicious dip!!! And everything here makes me want to NAB it from the screen. Must make! I love this dip too! I have a hard time keeping myself from eating the whole bowl!! Thanks for reading! I love the idea of filling crescent rolls! These look fantastic and so easy to make too. Easy was the word of the day! 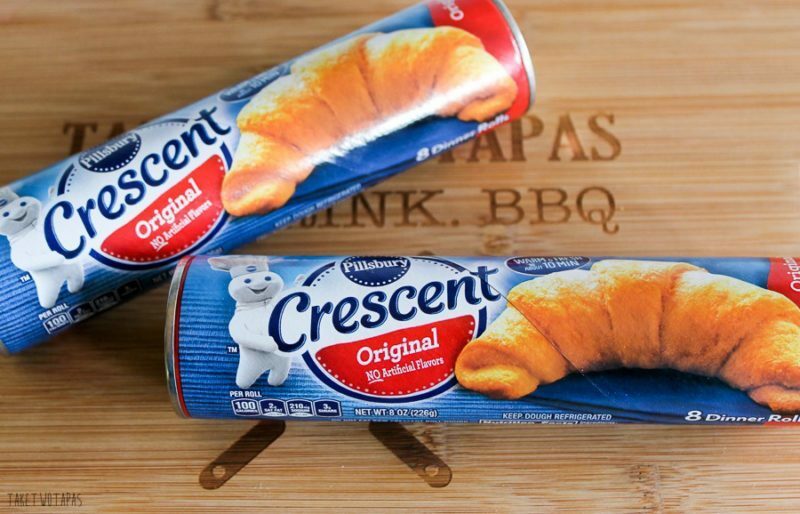 I usually have the ingredients for the dip on hand during the holidays anyway but the crescent roll wrapper means I can take my dip on the go with me. Portable food is good food! I love your family holiday traditions! They sound like so much fun. And this recipe looks like one that is perfect for a party. Thanks Marlynn! We are a weird bunch! These look fabulous. I love the idea of using the crescent rolls for this! Me too! I love a simple dough that is all ready for me to use! I loved doing all the R&D and the SC on this one for sure! You are always welcome Dee Dee! Hope you are well ~ I’m back for another giveaway! 🙂 My favorite tradition for Thanksgiving is helping my Mom bake lots of pies for the holidays. Plus we always watch the Macy’s parade! Great tradition! We always baked lots of pies and anatomically correct Christmas cookies:) Good luck on the giveaway! be sure to enter daily!